For the first couple hundred yards from the Trafford Veterans Bridge the railroad tracks remain on the trail. But from the endpoint of the tracks all the way under the Pennsylvania Turnpike the trail is in rather good shape, and is easily rideable by mountain bike save for the very short bridge over Simpson Run, which can be (reasonably) safely walked across. The two longer bridges in this section which run across Turtle creek itself are in remarkably good condition, and are bikeable as is. Southwest of Simpson Run there seems to be quite a bit of surveying going on. Northeast of the run several drainage pipes were placed under the trail in the past month or so. Also, during about the same time period (Feb 2016) the two pickup trucks were hauled out of Turtle Creek. From the Sewage plant just north of the turnpike towards central Murrysville at Trafford road the trail remains closed. Work on laying the new pipe seems to pipe progressing nicely, though. It will be great to see it finished, since the detour over Meadowbrook road is an annoying climb, and the alternate detour through Alpine Village on the other side of the creek is even harder. The bridge in Murrysville near Trafford road that had the ties that were in the worst condition was stripped down to its underlying metal truss sometime in Feb or early March. It is closed to traffic, but safely detouring around this one is easy. The next bridge, behind Hoss’s parking lot, has likewise had all of its old railroad ties removed, though detouring around this one seems to require a trip along Old William Penn Highway or even route 22 itself. Perhaps others can confirm if the other bridges farther down the line in Murrysville have likewise been closed for renovation. Earlier this winter those bridges were in okay shape (compared to the one near Trafford road), though I’m sure they will all at some point be getting new decks as part of the rail-to-trail conversion. As for those out there making it all happen, keep up the great work. This trail is indeed a dream becoming reality. Thanks for the wonderful review, @mattk! The Trafford Road bridge has gotten a new deck. Not sure if it is open, though. They say sponsorship is available for 2 more bridges, so I guess two more are coming. The two westernmost bridges over Turtle Creek itself seem to be ballasted decks, while the others seemed to be open decks (see here for definitions). It seems there are three more open deck bridges over Turtle Creek and one more open deck passing over Simpson Run (as mentioned above) which is very short compared to the others. It says in the above-linked post that the stretch past the sewer plant is almost finished, though they are not sure as to when it will become walkable. This section continues through the Turtle Creek Gorge, running through the hills which the detours climb over. Once Trafford Road is reached, one can go to Old William Penn Highway for a decent detour until the current west end of the Westmoreland Heritage Trail near Delmont. Interestingly, Turtle Creek forms the border, for most of the time, between Allegheny and Westmoreland counties, between Trafford at the location where Brush Creek comes together with Turtle Creek (near where the old Turtle Creek Industrial Railroad junctions with the Norfolk Southern mainline) and a point approaching Trafford Road near route 22. Therefore, the 2 ballast deck bridges actually connect between the 2 counties, and the stretch between the 2 bridges is in Allegheny County, while the rest is in Westmoreland County. Thanks for the update on the bridge. I saw that it had gone in a week ago, but I had no idea how they did it. Pre-building the deck in sections really made quick work of the job. Hopefully the bridge near School Road will soon get the same treatment. As of the beginning of this month the section where sewer pipe was being put in is actually open and walk-able, even ride-able (for the most part) with a mountain bike. The “trail closed” sign has been removed, and a week ago workers were using heavy equipment to fill in the last two remaining holes. Some straw has been put down over the section around and to the northeast of milepost #4. This does help with the muddiness issue, though this part of the trail isn’t draining very well, particularly to the areas northeast of the Abers Creek – Turtle Creek confluence. It’s still a work-in-progress to be sure, though it has reached the point that it is likely easier to ride / walk though this part of the trail than it is to dodge traffic walking up Meadowbrook road to get around this section. Though personally I’ll avoid trying to ride it the day after a rainstorm. I heard,(could be rumor), the Westmoreland Heritage trail ending in Trafford will be extended and hit the GAP trail. I’ve always wanted to ride this trail,but have no way to get there because I don’t have a car.I live near the GAP trail at the Waterfront.Does anyone have info of when they might begin construction and where on the GAP it will connect?? couldn’t find anything online about that using The Google. Closest I found was same article Paul posted in February. It is also part of the route proposed in the Rough Diamond Trail videos. An extension of the East Busway is proposed until Turtle Creek, from what I’ve read. If a trail will be built alongside (like some of the busway in Wilkinsburg) that may be a decent connection? You’ll notice that all of the articles above are about trail planning and trail building activity in Westmoreland County, not Allegheny County. The Turtle Creek Rail Trail plans, so far, are all upstream of Trafford. I know of no concrete plans for trail-building downstream of Trafford, between there and Braddock or Whitaker, only broad proposals. Downstream of Trafford, the most advanced effort I know of is by Debra Brown, Braddock council chair. She is coordinating an effort among several towns and boroughs (e.g. Braddock, Turtle Creek) to plan bike trails in the area. Lobby a member of Allegheny County council if you favor a connection from the GAP to the trail in Trafford. Just watched “Diamond in the Rough Bicycle Trail” by David Conrad. Apparently from what I was watching there are plans in the future to connect the W.H.T. to connect with the GAP trail.If David Conrad sees this post,maybe he could give us more info on when they might start the plan, and where on the GAP it will connect. Do you ride on road at all? If so, the trip to the Westmoreland Heritage Trail from the Waterfront would be very doable on a slow Sunday morning. You’d ride through Braddock, past Edgar Thompson Works, stay below the Tri Borough Expressway on local roads, then return to Route 130 (don’t know the name) near the Irish Club. This is the only part of the trip I’d really worry about, but it’s only dicey for about a half mile. Ride through downtown Pitcairn, then straight past Sheetz and Speedway to downtown Trafford. A right at the end of the bridge, and another right under the bridge will set you on the western end of the trail. As noted earlier, there are efforts underway to make the Turtle Creek Valley (the area you’d be riding through) more bike friendly and explore trail options, but they don’t have firm trail plans yet (that I am aware of). I know that David Conrad has been active in this effort, and I presume he is working with Debra Brown of Braddock City Council. Thanks Swaloort for the information.I will look on a map to find the route you are talking about.I mostly ride on trails and avoid roads,however if the roads aren’t high speed and also have a berm of 18 inches or more It won’t bother me.Thanks again and hopefully efforts will be made in the future, for people like me, that do not have a car to make roads as safe as possible to travel to W.H.T. or any of the other trails. You won’t like the route out to Trafford, then. I ride these roads (as far as Turtle Creek) every day. Wow…..and Trafford is even further out than Turtle Creek. I have to go past Turtle Creek to get to Trafford. Unless they improve the way to cycle there,(which may never happen),I will rely on friends to drive me there.Thanks Jonawebb for the information. Phase III is the 5.9 mile section of trail between Trafford and Murrysville. Construction of Trail Contract awarded to Facchiano Contracting Inc. of Pittsburgh. $1.38M. Pre-Construction Conference held with PennDOT on November 15, 2016. Physical construction scheduled to commence on March 1, 2017, though some tree clearing and grubbing may start once the ground has frozen. 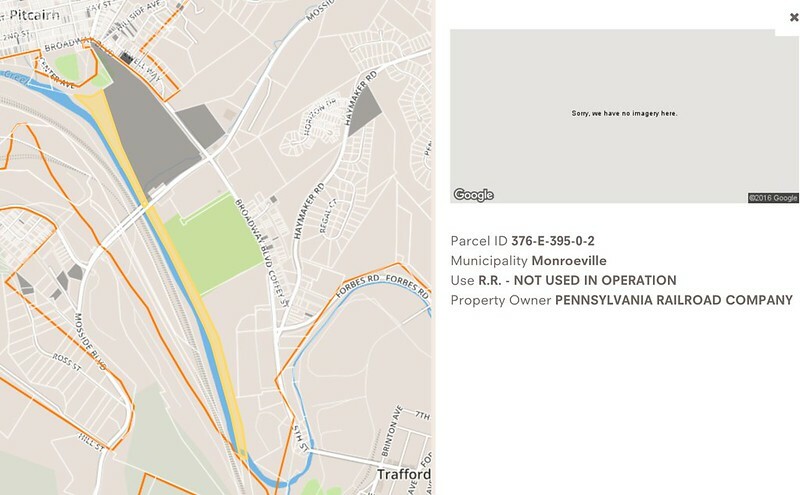 For renovation of two long, concrete deck bridges (one over Turtle Creek at Penn Twp/Monroeville boundary, and second over Turtle Creek at Monroeville/Murrysville boundary), contract was awarded on November 17, 2016 to Urban Corporation of Trafford. Bridge project shall be coordinated with PennDOT Trail Project, with planned completion date for each of August 10, 2017. Phase IV is the 3.4 mile trail section between Murrysville and Export. Along that section, the development of a ‘Park-Ride’n-Walk’ facility has been funded by SPC’s 2016 Livability through Smart Transportation (SMART) program. Project proponents include Westmoreland County Transit Authority (sponsor), Westmoreland County Planning, and Westmoreland County Parks and Recreation. This project is envisioned to provide approx. 50 parking spaces, a park-‘n-Ride Transit stop, and trailhead along the WHT. Project scoping session with PennDOT held November 16, 2016; soon to go into Design,… anticipated construction in 2019. On Thursday evening, December 8, 2016, the WHT Chapter is hosting a Christmas party, celebrating the implementation of WHT-III, at the Spaghetti and Steak House on Rte. 22 in Murrysville, 7:00 PM (near Delmont). You all are invited! I live in Irwin, and a few of us would like to get in touch with those responsible for this trail. Will someone PM me? I don’t have all of the maps, but back in the day, there was a street car that ran from Irwin to Trafford. I wonder about the possibility of connecting Irwin to Trafford (ultimately to the Westmoreland Trail). Some of that street car right-of-way (1/4 of the way to trafford) is occupied by FirstEnergy power lines. Back about 6-7 years ago, I approached Allegheny Energy (before they because FirstEnergy) about using the right of way, and they were agreeable to the proposal. BUT… I ran into trouble when contacting a few homeowners that have homes next to the old streetcar path. Since at that point, we were only looking at a mile or two trail that didn’t actually go anywhere, I dropped it – it wasn’t worth the fight. However, now that the trail could actually go somewhere, it may be worth bringing back up again. Irwin was a hub of street car traffic… there are many other connections live in possibility from there. We don’t have the expertise to get this rolling, but there is interest. Where do we begin? As mentioned earlier, On Thursday evening, December 8, 2016, the Westmoreland Heritage Trail Chapter is hosting a Christmas party, celebrating the implementation of WHT-III, at the Spaghetti and Steak House on Rte. 22 in Murrysville, 7:00 PM (near Delmont). You all are invited! I learned at the party last night: construction of the trail between Trafford & Murrysville might start earlier than March 2017 and it will be done by August 2017. To connect between Murrysville and Delmont, they’ll need a crossing or bridge at Route 66. Or maybe a tunnel – one idea: use the coal mines that already exist there to go under Route 66? Is that the PA Turnpike part of Route 66 over there? At that level of zoom, you can easily follow the cadastral lines indicating the old rail right-of-way. Toll-66 has only been there since about 1990. The railroad was in use through the 1970s. I’m not sure when it was abandoned out that far. There was still rail service to Murrysville (White Valley, to be exact) at least into the 1990s. I’m going to guess 1970 as about the end date for abandoning the line from White Valley to wherever it went. I’m sure someone out there knows for certain. How does this Rail Trail fit into the trail that is in Greensburg. the Five Star trail. My wife has been on it after work and was disappointed by the short length and its disjointedness. I haven’t experienced it first hand. They miss one another by the north-south distance between Greensburg and Delmont, that is, about six miles. Old 66, a.k.a. North Main Street out of Greensburg, might be a decent road to bike on, but I’ve never biked on it. Theoretically all the heavy traffic has been moved over to Toll 66, the Hutchinson Bypass. Edit: Also the east-west distance between Export and Delmont. I saw a video, (Diamond in the Rough),that the Turtle Creek Trail will eventually extend from Trafford and hit the Steel Valley Trail somewhere between Rankin and Duquesne.Is it just rumor?Does anyone have more information?I live in the city and would love to see this happen. @cycleguy asked about possible future trail between Trafford and Rankin. I wrote about that a bit earlier in this thread (http://www.bikepgh.org/message-board/topic/turtle-creek-rail-trail/page/2/#post-328154). We need more people working on this. @paulheckbert, What can we do to help make this happen? After Pitcairn Park going toward Turtle Creek and Bradock, I haven’t completely worked out every turn yet. But it’s definitely doable, with a combination of railway re-use and bike lanes on low-traffic roads. But what is the first step to get there? To those who got the Murrysville to Trafford section rolling, how did you begin? Hopefully the Trafford to Rankin section can begin the same way. Jeff Richards <JRICHARD@co.westmoreland.pa.us>, Parks Planning Coordinator, Westmoreland County. He could tell you how Westmoreland County have planned and are builing trail between Saltsburg and Trafford. Deborah Brown <braddockmanager@comcast.net>, Braddock borough manager. She is working on a grant to study bike trails among several boroughs, including at least Braddock, North Braddock, East Pittsburgh, and Turtle Creek. If you want to lead a walk or bike ride of some of these areas near Trafford & Pitcairn, some time, I think we could attract several people. How traversable is the path in question now? I would walk it, or push or ride a bike, with a video camera in hand, to show people how do-able it is. I did this a couple years ago with a “goat path” in Schenley Park, from an established trail down the hillside to Boundary Street, and again a couple months ago, with a proposed trail in Ross Twp. In particular, looking at the area in question on Google Earth, you’re right up against what looks like a school bus storage area. Can you get past there now? Will the bus yard need to be moved in a couple of feet? If so, you’re likely facing several obstacles from that facility, at least the expense of repositioning the fence. But if you can already roll past there without problem, that’s what your video would show. Edit: This is what I sent to the Walk\\Bike Ross group a couple months ago. This reply was modified 2 years, 4 months ago by StuInMcCandless. Thanks guys. I’ll put together an e-mail to our friends in the respective parks departments, but only after I’ve put some more thought into all of it. I know people like to see something more akin to a “plan” rather than just an “idea” presented to them, and I know there are probably still many ideas to kick around to determine which should be presented as optimal. Does anyone know an easy way to find out exactly where property lines begin and end, who currently owns what, and what the estimated values are? Obviously any business owner whose parking lot has to be reconfigured will have to be fairly compensated for the expense, but it’s hard to tell just who (if anyone) owns much of the abandoned rail corridor. I’d like to find a way to keep the proposed bike trail a true “rail-trail” whenever possible. This isn’t just for historical preservation, but for the aesthetic value and added safety that goes with having a trail alongside a creek as opposed to having a trail alongside a busy highway. 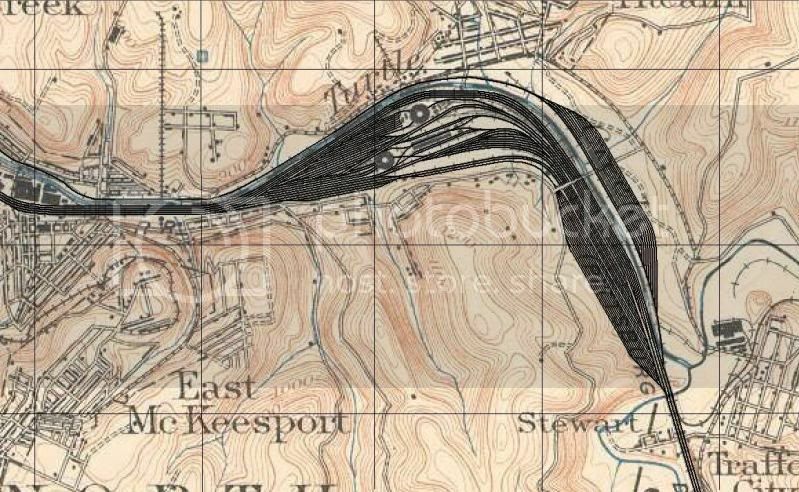 Here’s an old map I found that shows where the rail line north of the creek used to be. Anyone who takes a walk behind the driving range and the shopping center will quickly see where the rail once was. Back when I rode there the trail had a consistency similar to what the Trafford to Monroeville section of the Turtle Creek Greenway has now: a fairly smooth ash-like surface with scattered larger chunks of ballast rock. When I walked it a few months ago it was still in pretty good shape. @mattk: two real estate search sites are http://www.lotstolove.org/ (good) and http://www2.county.allegheny.pa.us/RealEstate/Search.aspx (klunky). The former yields the following (I clicked on the lot highlighted yellow). Hmmm, Pennsylvania Railroad. Wikipedia tells me “At one time, the PRR was the largest publicly traded corporation in the world, with a budget larger than that of the U.S. government and a workforce of about 250,000 people”, that they went bankrupt around 1970, and that Norfolk Southern acquired most of their land. If you contact Jeff or Deborah, they might have contacts in the area that could help figure out some of the property issues. MattK, you might also want to contact some of the folks quoted in this PG article from August 2016. It mentions the former trolley line, and the idea of a trail from the Westmoreland Heritage Trail at Trafford to the GAP. In his “Rough Diamond Trail” videos, David Conrad mentions the mayors of Braddock and Turtle Creek, who appear to be supportive of bike lanes. From 5:20 to 6:00 in the video, he’s biking between Trafford and Murrysville. This Turtle Creek Rail Trail thread, because of its inherent excellence, made it onto BikePgh’s list of 2016 Best of the Message Board. The oldest map I’ve found so far that has a Trafford to Rankin rail-trail sketched out is in a Turtle Creek watershed conservation plan from 2002. The map can be found on page 122 of the plan. The map refers to it as the “Forbes Trail” and appears to have it running to the north and then to the south of the creek as it winds downstream. I haven’t looked at the southern side of the creek yet, since the tracks on the southern side are very active unlike the tracks on the north which are either abandoned or already removed completely. I tried to read up a little bit on the Pittsburgh Trolley Line. From this old document it seems that some sort of passenger rail line did run the Turtle Creek – Wilmerding – Pitcairn – Trafford route. On my walk along the north side of the creek I did not find any evidence of trolley tracks (thought I didn’t check every street). I did find some old tracks in Pitcairn near the auto shop in a very old roadbed paved with bricks. I counted 14 bricks between the rails, which if the bricks are 4″ wide would make it around 4′ 8″ between the rails, or about standard gauge, not Pennsylvania Trolley gauge, which is closer to 5′ 2″. This, along with the old map posted earlier, indicate that the surviving rail corridor north of the creek between Trafford and North Braddock is a spur of the Pennsylvania Railroad, not the Pittsburgh Trolley. This also matches with the owners listed for the rail corridors: 376-E-395-0-2 is listed as the Pennsylvania RR Company, the next down stream is 642-N-398-0-1, owned by Conrail, the heir to the PA RR and other freight lines that went bankrupt. Interestingly, these two parcels were both assessed around $2000/acre, which is about the same as the assessment of 642-N-398, which is one of the sections of the Turtle Creek Industrial Railroad purchased for the section of the Turtle Creek Greenway now under construction. The Westmoreland County Bureau of Parks has recently received PADCNR funding to conduct a feasibility study for the planned Saltsburg to Export to Trafford Rail Trail (Figure 12). This 17-mile proposed rail trail corridor would connect the Beaver Run Reservoir Greenway to the Conemaugh River Greenway Trail System. Other trails proposed by the Westmoreland County Bureau of Parks include the Tinkers Run Trail and the Manor to Claridge Trail (Figure 12). 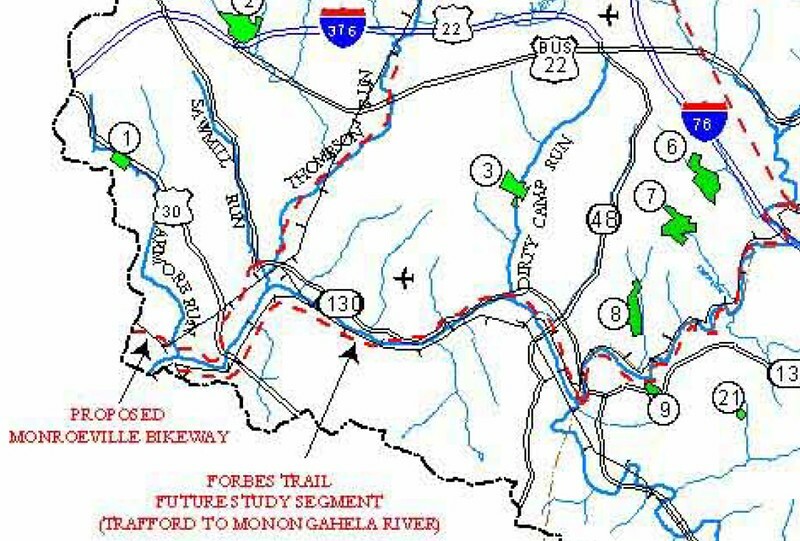 In Allegheny County, the proposed Monroeville Bikeway and Forbes Trail (Trafford to the Monongahela River) are under study (Figure 12). So the trail between Saltsburg and Trafford that Westmoreland County began feasibility studies of around 2002 is now more than half built! Dashed red shows proposed trail. Yes, it appears this proposed route has the trail crossing from right bank to left bank in Wilmerding. If you did that you’d have to cross back before Edgar Thomson Works, probably. The proposed trail up Thompson Run toward Monroeville Mall is also interesting. If the Mon-Fayette Expressway (gag) is extended up that valley then maybe we can get a freeway-with-trail there. The map shows a spur from Murrysville toward Boyce Park. That would be nice. It is owned by the Regional Industrial Development Corporation of Southwestern Pennsylvania. The track has not been used since the 1980s. And here’s the big one: in late 2014 Allegheny spent $365,000 to re-build the last 1/4 mile of this unused, dead-end track. WTAE reported on this. I know that purchase costs can exceed assessed values and that there are always closing costs and such, and I know this represents a rather rosy scenario. But if the county could buy out not just one plot of land, but all of the plots in the entire 6.1 mile corridor from right next to Trafford to right next to Braddock…why did they spend twice as much money to repair the tracks on an unused, dead-end rail section whose best possible use involves having its tracks removed again to become a rail-trail? For those who haven’t heard yet, last week it was announced that Westmoreland County would be getting an additional $1million dollar grant from PennDOT for the construction of the 3.4 miles of the trail from Murrysville to Export. No word yet on when major construction on this section is expected to begin. Work on the three bridges in this section is being funded by donations and done by volunteers, so they already have a head start. The old deck on the bridge behind Hoss’s was removed last year. As of new year’s day most of the first structural layer of the new deck was already in place.